In this day and age, it's all about cramming as much as we can into our schedules. We get fast food to eat on the go and get more done. We fill up our planners with all kinds of activity. Some people even have personal assistants for it. I get it. Nowadays we're always busy. We're on the go, rushing from one event to the next. But the thing is, we've begun to glamorize being busy. People complain about how busy they are and even try to one-up the person next to them about being more busy. Except the thing is that I'm not busy. When you're not constantly doing things, you hear about other people and everything that they're doing and feel like you're wasting your life. I often find myself pretending that I'm more busy than I actually am. Granted, there are some days where I am legitimately very busy, but most of the time, I'm really not doing much and I sometimes feel bad about it, like I should be busier. So when someone complains about how busy they are, I nod and act as though I have all these plans packed into my schedule. So you know those jokes where people are like "I don't have a life" because they don't do anything with their social life and mostly stay home all day? This is the art of pretending to have a life, pretending to be busy and active. I'll be blunt. My life is not always packed with social activity. I generally have social plans maybe every other week, twice a week at the most, which is pretty rare. With social media everywhere, you end up lying in bed and seeing all the pictures from the social events that you weren't invited to. (don't let it get you down, have a party for one!) And it hurts a little, to see everyone out having fun while you just laid in bed watching Netflix and not being productive. However, there are lots of social events that you might not particularly enjoy. Recently I've been learning to say no to social events that I'm not really up to or just not interested in attending. Just because you're invited, doesn't mean that you're obliged to attend. Sometimes I'm just not feeling it, I'm not emotionally up for it. So it's okay if I don't go. I don't need to pretend to be busy with social plans. Sometimes you just have to say no. As tempting as it is to join in with the fear of missing out, you don't need to pretend to be swamped with social plans to feel good about yourself. If you didn't know already, I'm in high school. I also participate in no sports and just a few extracurriculars. Meanwhile, my friends might be juggling sports with academics with five clubs. Don't get me wrong, participating in extracurriculars is great and all, but even though I'm still doing extracurriculars, ones that I am devoted to and actually enjoy, a part of me still wishes that I was doing more. Those people that juggle all of their time consuming extracurriculars with schoolwork and social plans end up staying up on all-nighters to get things done. They're constantly busy. And even though I hate the idea of an all-nighter (I've never pulled one) and I like my sleep, I still feel like I should be that crammed with activity as well. But does it really matter if you're a part of extracurriculars that you don't even enjoy? For example, I used to play the piano. Obviously I still can play, but I never enjoyed it much. However, I had been doing it for 10+ years and felt obliged to continue, plus I didn't have many extracurriculars going at the time. But in the end, I never really enjoyed it. I hated practicing and I hated performing. So does it really matter if it doesn't make you happy? Be in extracurriculars because you want to participate in them, not to fill up your schedule, because at the end of the day, it doesn't matter if you were in one or ten extracurriculars, as long as you're passionate in whatever you do. However, I've come to realize that being busy is over glorified. Are you really winning if you're constantly stressed out about getting everything done? I think the people that aren't busy, that know how to get things done and still have time for themselves, are the real winners in the situation. So why do we glamorize being busy? 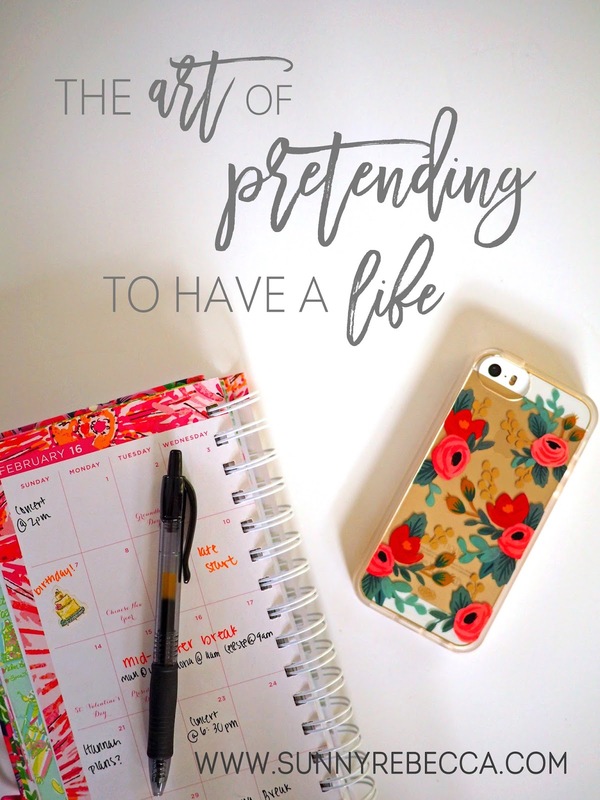 Why do we feel pressured to "pretend that we have a life?" I think that it has really become a part of our society, encrypted into the way that we think, feel, and act. We feel that since everyone around us is busy, then we should be too. It gives us a sense of significance and purpose. We see celebrities and rising entrepreneurs and their exciting and busy lives and connote busyness with success. It's natural to automatically assume that if you're not doing anything that's keeping you busy, then you don't have a life's purpose. But that's not the thing, you do. So what if your agenda isn't filled to the brim with social plans and work things and whatever it is that people are pretending to be busy with? And so what if you spend more time watching Netflix than you would like to let on? I think that it's time to embrace not being busy. Instead of perfecting the art of pretending to have a life, we should only do the things that make us happy. The art of pretending to have a life is a pathetic one, so why even spend a single minute of our time trying to perfect it? There are only so many hours in a day and I'm not going to waste them doing things that don't make me happy and pretending that I'm busier than I actually am, because in the end, my life is about me. As selfish as it sounds, it's true. It's your life for a reason. It's not Bill Gates' life. It's not Taylor Swift's life. It's your life. And I say that we should make the most of it. Let's not bother pretending to have a life and let's start living it. Preeeaaaach! Love this post. I know exactly how you feel. I've never pulled an all nighter either and I always feel awkward because I'm never as busy as my friends! But you are so right- I should just enjoy my free time while I have it, because I might not have as much when I graduate and go to college! I'm glad that you enjoyed this post!